A Successful Job Search: It's All About Networking Most people still hunt for jobs primarily by looking at positions posted online. But experts say networking with friends and acquaintances, as well as looking for connections in companies or with people you want to work with, are more effective tactics. 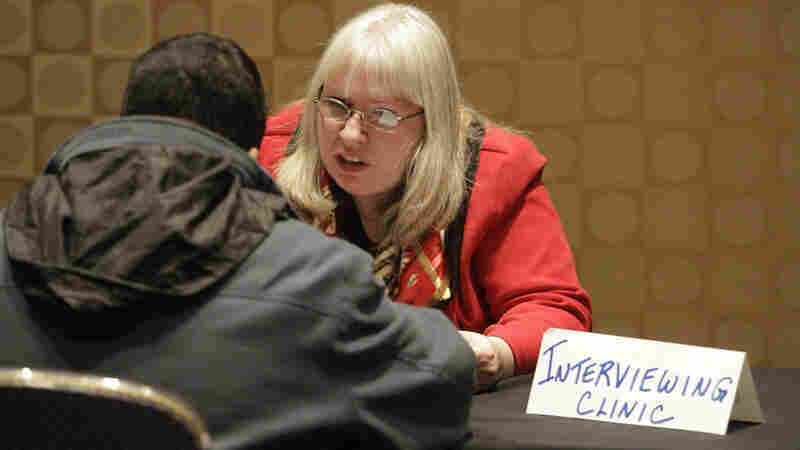 Kelly Rice, an independent human resources counselor, volunteers as an interview techniques trainer during a job fair in Boston. Matt Youngquist, the president of Career Horizons, tells job seekers that finding a new position presents the same challenges as taking a product to market. But the product they are selling is themselves. "First, you've got to know what you are selling and to whom," he says. "Then, you've got to package it up properly." Next comes the all-important execution phase. Networking is essential. Most people still hunt for jobs primarily by looking for positions posted online. Websites like Indeed.com and Simplyhired.com aggregate job offerings and make searching easier. —Wake up early every day to get started on your search. Treat it like a job. —Network aggressively: Look for connections in companies or with people you want to work with. Use the people search function on LinkedIn to help with this. —Make 100 new contacts a month by making cold calls, sending e-mails or even showing up at a company's door. —Research companies you want to work for and write customized cover letters focused on what you could do for a company as a future employee. —Find the hiring manager for positions you're interested in or at least get to someone who can put in a good word for you with that person. —Search websites like Indeed.com and Simplyhired.com, which aggregate job offerings and make the online search easier. But just sending out resumes, even hundreds of them, in response to ads probably won't help that much. The reason, Youngquist says: Most jobs aren't posted or advertised publicly. "At least 70 percent, if not 80 percent, of jobs are not published," he says. "And yet most people — they are spending 70 or 80 percent of their time surfing the net versus getting out there, talking to employers, taking some chances [and] realizing that the vast majority of hiring is friends and acquaintances hiring other trusted friends and acquaintances." Los Angeles-area resident Terri Garfinkel, for example, e-mailed past employers after she was laid off from her job at a high-end retail bakery, telling them she was looking for a new position. It took a while, but she landed a job with someone she had worked for just briefly a decade ago. That personal connection is especially important now. With so many people applying for jobs, it's hard to get noticed. Ashley Stirrup, the vice president of product marketing at Taleo, which creates software to help companies sift through job applications, says major companies typically receive about six times as many applications as there are employees in the company. "So, for a 30,000-employee company, that would be 180,000 applications a year," he says. Youngquist, the career coach, suggests job seekers network aggressively, looking for connections in companies or with people they want to work with. He often directs job seekers to the people search function on the networking site LinkedIn. Get to the hiring manager, he advises, or at least get to someone who can put in a good word for you. Another tip from Youngquist: Individuals looking for work should make at least 100 new contacts a month by making phone calls, sending e-mails or even showing up at a company's door. It's the same type of work a sales representative often has to do — making cold calls and hustling to find new business. "It takes X number of contacts to get this many appointments, to get this many chances of actually getting a sales opportunity or a job," Youngquist says. "I do think volume is a big part of it." He says many people's efforts are "really anemic." Former pharmaceutical sales representative Camilo Ruan says the smartest thing he did in his job search was treating the hunt for work as a job. He says he would get up early every day and get to work. Among other things, Ruan used his knowledge of firms he was interested in to create customized cover letters that focused not on his past performance, but on what he could do for a company if he were hired. His well-informed and aggressive efforts paid off. He landed what he calls a great position at the package delivery company TNT Express, and he's making more money than in his previous position. Experts say that even though the job market is undeniably tough, there are more positions available than many people think. But job seekers will have to be smart and disciplined to find them.